Access to Cancer Care for Low-Income and Uninsured Patients: Nurse and Social Worker Online Training CE is now closed. 2015 Summit on HPV-Related Diseases Presentations available. Nurse and Social Worker Online Training CE is now closed. Many Texas nurses and social workers work with low-income and uninsured patients, particularly those in rural and underserved areas and areas with large Spanish-speaking populations. Increasing nurses’ and social workers’ knowledge about the importance of this issue and improving their competencies in using the best procedures to get their patients and clients the information they need can improve access to these services and ultimately improve outcomes. This educational activity is funded by a grant from the Cancer Prevention and Research Institute of Texas. Access to Care Training for Nurses CE is now closed. Access to Care Training for Social Workers CE is now closed. Us vs. HPV Webinar Series January 22 – 28, 2019. Webinar Recordings Now Available. With more than 12 million cancer survivors in the United States, there is a growing need for cancer survivorship management. Lewis E. Foxhall, M.D., vice president of Health Policy and professor of Clinical Cancer Prevention at The University of Texas MD Anderson Cancer Center says the number of cancer survivors will continue to grow thanks to improvements in treatment and changes in the availability of screening and prevention interventions. In his lecture, "Cancer Survivorship Management for Health Care Professionals," Foxhall breaks down the types of cancer survivors and the duration of their survival. He gives an overview for the risk of recurrence, the risk of developing a second primary cancer, and discusses late effects from treatment cancer survivors might face. Foxhall also explains why prevention and health promotion is a critical part of care for cancer survivors. This course will be of value to Primary care health professionals: physicians, physician’s assistants, nurse practitioners, nurses, social workers, genetic counselors and community health workers. Presenter: Therese B. Bevers, M.D. Click here to view the lectures. 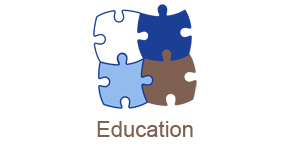 The goal of this activity is to address the ongoing need for educating practicing physicians about new cancer therapies and screening, current treatment guidelines and resources available to assist them in their cancer screening practices. Also, the activity will focus on new advances within the last year along with other ground-breaking scientific discoveries. In conclusion, physicians will have a new awareness and knowledge in optimal use of new therapies for cancer and screening practices. Apply current screening guidelines and recommendations to detect cancer in primary care setting early enough for optimal referral to specialists who provide up-to-date optimal treatment plans (Knowledge, Competence, Performance, Patient Outcomes). This conference should be of value to medical oncologists, hematologists, primary care physicians and other healthcare professionals. The University of Texas MD Anderson Cancer Center designates this live activity for a maximum of 15.50 AMA PRA Category 1 CreditsTM. Physicians should claim only the credit commensurate with the extent of their participation in the activity. 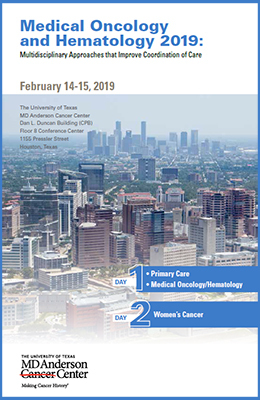 The session entitled, Medical Ethics, has been designated by The University of Texas MD Anderson Cancer Center for 1.00 AMA PRA Category 1 Credits™ in medical ethics and/or professional responsibility. For more information and a link to online and printable registration, visit the conference website. Printable registration form is also available in the conference brochure.